Theme park visitors were stuck on rides because of a power cut at Chessington World of Adventures. 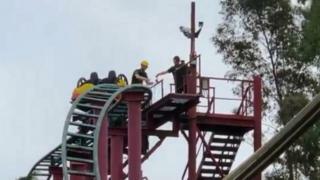 Sixteen people were rescued from two rollercoasters after the loss of power in the local area on Friday afternoon. A spokeswoman for the Surrey attraction confirmed people had been helped down from rides. She said the power cut had "impacted operation" on Friday afternoon and evacuations had been carried out on rides that were at a high level. One visitor tweeted that people were being rescued and added: "I'm never going to a theme park again." Melissa Neilon also posted to say that there was "no communication from staff about what happening". The theme park said every ride has a platform next to it so all visitors would have been helped on to that and then would have been able to walk down stairs. "We got all our guests down within half an hour," the spokeswoman said. "We were affected by a power cut in the local area. We are working to resolve that, but guests in this instance are our primary concern." But visitor Ian Moyse tweeted that people had been "left in the dark". Chessington's spokeswoman said the power went off just before 15:00 BST and was restored at 16:10 BST by UK Power Networks. She said all rides were subject to safety checks following the loss of power so returning the park to full operation would take time. The first ride was back up and running at 16:20 BST, she added. The theme park confirmed that no emergency services were called to deal with the situation and said no-one required medical help. Marianne McGoldrick, a member of the theme park's senior team, said: "Our guests are our number one priority and we understand the disappointment this would've caused. As a result we are re-validating everyone's tickets from today to be used up until Tuesday 31 July." But on Chessington's Facebook page, Lisa Dawson wrote it was "not fair" because most visitors on Friday were on their half-term break and would not be able to return. Hayley Hill wrote: "Unprofessional staff, didn't have a clue....1000's of people sent home at the same time." Some defended the park, but Johanna Payne-Knauf wrote: "Thank you Chessington! Has been a little bit more like Stressington today." Chessington's operator Merlin Entertainments saw a fall in visitor numbers in 2015 at Alton Towers after a crash on the Smiler ride at the Staffordshire park. Merlin was fined £5m over incident in which two carriages on the rollercoaster collided, leaving five people severely injured - including two teenage girls who needed leg amputations. UK Power Networks said power was interrupted to 272 customers in North Chessington at about 14:50 BST following a fault with a piece of electrical equipment. A company spokesman said engineers restored supplies to most customers by 15:20 BST, adding: "We apologise for any inconvenience caused."